Visio offers an interesting option for sharing noneditable versions of your diagrams. Saving your diagram as a web page creates dynamic web pages that render high-quality vector-based graphics; support multipage documents; and allow users to pan and zoom, view Shape Data, and search for text. When this option works, it is fantastic. Unfortunately, there are a few glitches that can mar the experience, as you see later. Start with a copy of the IT Asset Management sample drawing, which you find under File, New, Sample Diagrams. Note the server shapes on the Topology page have hyperlinks that link to the other pages in the document. To follow them, right-click the shapes and choose the link item or hold down the Ctrl key and click a shape. a. Select the shape and press Ctrl+K to get to the Hyperlinks dialog. Note that a Row 1 Rack 2 link already exists. b. Click New. A new hyperlink item appears and is selected. c. Enter www.visguy.com in the Address field. e. Enter www.lenovo.com in the Address field. f. Click OK. The server shape now has three hyperlinks—one within the document and two that go out to Internet sites. g. Ctrl+click the server shape and note the special “multihyperlink” pop-up that appears. You see something similar to Figure 1. Figure 1. Ctrl+clicking a shape with multiple hyperlinks presents a nifty pop-up for choosing the link to follow. Save your modified file as IT Asset Management SAW (SAW = Save As Web). Export the file as a web page. Go to File, Save & Send, and then click Change File Type. The right-side of the panel displays a wide assortment of output types, which are shown in Figure 2. Double-click Web Page (*.htm). The Save As dialog appears with the Save as Type set to Web Page (*.htm;*.html). Browse to a suitable location on your hard drive and save the file as IT Asset Management SAW and then click Save. The Save as Web page status window appears for a few moments as Visio exports the diagram. Then your default browser opens to reveal the exported web pages. Figure 3 shows what you might initially see. Figure 3. A fresh Visio web export, shown in IE9. Until you allow the blocked content to run, the fancy controls are missing. You can also use File, Save As to create a web page. Just select Web Page (*.htm;*.html) in the Save As Type drop-down. You might find this faster than the whole File, Save & Send, Change File Type, Web Page chain described previously. 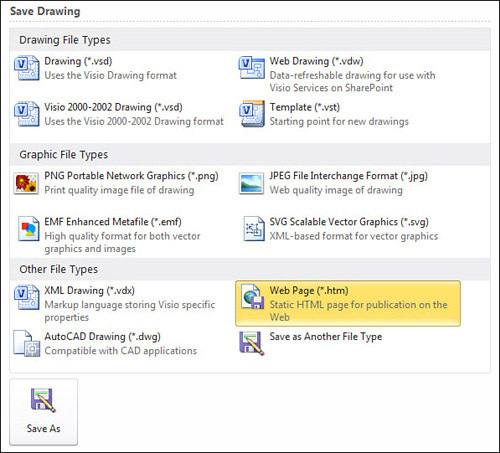 Saving a file as a web page doesn’t save the actual Visio drawing! If you’ve made changes in Visio, be sure to save the drawing as you normally would.